One of D.W. Griffith’s earliest films, 1909’s A Corner in Wheat begins with a poor farmer (James Kirkwood) and his father (W. Chrystie Miller), both busy planting and sowing grain. From there, we’re introduced to a wealthy businessman, referred to throughout the movie as the Wheat King (Frank Powell), who, by way of a few financial transactions, has managed to corner the market in wheat, allowing him to raise prices as much as he desires. Naturally, this leads to an increase in the cost of bread, as we see when people standing in line at a local bakery are told they must now pay $10 per loaf, as opposed to the usual $5. Some simply cannot afford it, including the farmer himself, and as the common people struggle to obtain the bread, the Wheat King is busy holding fancy dinner parties, celebrating his new-found wealth. But as the Wheat King will soon discover, fate has a way of catching up with you in the end. A Corner in Wheat runs a scant 14 minutes, yet even at this abbreviated length Griffith manages to get his point across. Of course, it’s not a subtle one, and some scenes are a bit heavy-handed (the farmer’s wife, played by Linda Arvidson, is turned away when she’s unable to come up with the extra $5 for bread), yet it’s the technique employed by Griffith that makes this such an interesting film. Relying on a method known as “cross-cutting”, where two separate scenes, happening at two different locations, are edited together to look as if they’re occurring simultaneously, Griffith flashes back and forth between the Wheat King’s dinner party and the bread line, drawing a contrast between those who need the bread to survive and the select few (in this case, one) getting rich as a result. 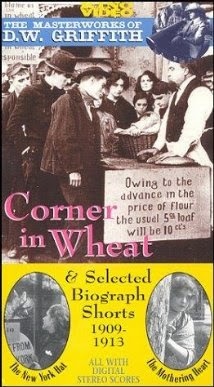 A social commentary that’s admittedly dated, A Corner in Wheat is nonetheless an integral picture in the career of D.W. Griffith, an early work that showed audiences what could be achieved with a movie camera and a couple strips of film.